Adam Lisagor never wanted to be in front of the camera. To this day, he’s a little surprised his clients request that he be in front of the camera for their digital marketing. Yet his bearded face and nonchalant attitude are a key part of the visual style of his video agency, Sandwich Video. It’s so distinctive that even if you don’t know the names, you’d probably recognize it when you saw it. We chatted with Adam about how young video agencies and filmmakers, developing their own visual style and creative voice. To his mind, there are three keys to developing your own visual style and creative voice. The kind that attracts clients and projects, whether you’re running a video marketing agency or directing the next Star Wars. We’ve talked about what you can learn from Sandwich Video before -- but there’s something genuinely authentic about talking with Adam. An admitted introvert, he comes across someone who isn’t putting on a persona or playing a character. Certainly not someone who you imagine as working in video marketing -- overly slick, with an impossible grace most of us don’t have. But that sense of personal authenticity is what helped him, and Sandwich Video, achieve their position in digital marketing. Adam has discovered through dint of experience that whenever he tries to fake enthusiasm for a product that he doesn’t feel, his video marketing falls flat. He partially attributes this to a lack of acting talent on his part, but he also believes that modern day audiences have grown far more sophisticated. We know when someone is being genuine, and we know when a digital marketing agency or a video agency is just trying to drain our wallets. Despite his personal discomfort with the camera, he’s pleased at the positive reaction to it. He likes to think it’s because people are being spoken to by someone who actually looks like them. Even when he’s behind the camera, Adam’s authenticity pervades all his marketing videos, starting with the conception phase. Even though all of Sandwich Video’s clients, from startup to Starbucks, reach out to them, Adam and co. still have to go through pitch process like everyone else. Once they have the product in hand and know they want to work with it, the most important thing for them to do is record their own emotional reactions to the product and use it as part of their pitch. So whatever emotional reaction Sandwich Video conveys in their video, it’s the exact reaction they had when they tried out the project. 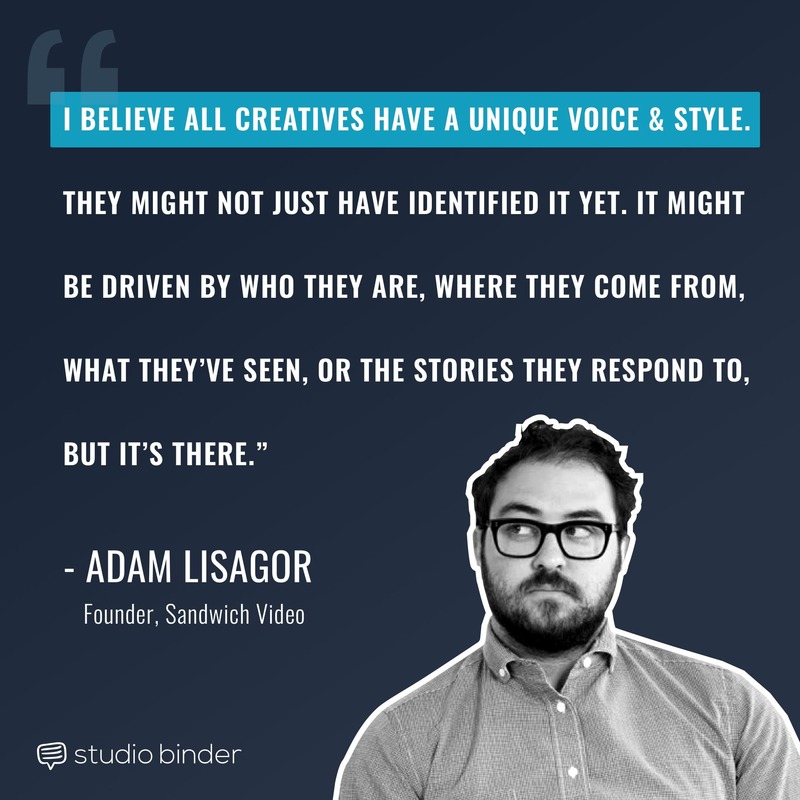 This sets them apart from other video marketing agencies -- if Adam Lisagor is talking about a startup to you, it’s because he and his team genuinely like the product. This even extends to their pricing -- they’ll work with less heeled startups who can’t pay Sandwich Video cost in exchange for an equity or revenue deal. In the world of video marketing, there’s one phrase that resonates deeply with Adam. As Adam explained before you can sell a product, you have to understand the product. Essentially, you have to eat dog food before you can sell dog food. Sandwich Video has yet to force their employees to eat dog food, but the principal remains. Perhaps the best digital marketing video that showcases this is the Sandwich Video’s “Slack” spot. As Adam explained it -- this video is more or less accurate to how their actual experience with Slack went. There’s an old saying: “Write what you know” -- Adam and his team knew Slack and how it could change their workplace because they used Slack and saw how it changed their workplace. The first thing you have to realize when you develop your visual voice is that it has to be your visual voice. It can’t be stolen from someone else or an assumed persona. That doesn’t mean that all there is to creating your own artistic voice is just put yourself in front of the camera, though. There’s a deeper layer you need to go to find it. These adjectives could all be used to describe Adam himself, but there’s another element that people remember about Sandwich Videos content -- their seamless use of computer graphics. Adam Lisagor never set out to work in the tech startup space, or even in digital marketing. He certainly never set out to found a video agency. His original passion was filmmaking--specifically, computer graphics. He knew computer graphics. He understood computer graphics. He was good at computer graphics. So when he made a marketing video for his own startup app, you know where we’re going with this. This comes across in one of Sandwich Video's earliest explainer videos for Square. When it came time to found his own digital marketing agency, he continued using clean, colorful computer graphics to represent that human interaction with the product. His background and expertise with computer graphics not allowed him to spice up videos, but also experiment with them in interesting ways. The wonderful thing about this advice is that it’s applicable even if you aren’t interested in a career in video marketing. If, say, you wanted a career in filmmaking. In his seminal book “Rebel Without a Crew”, Robert Rodriguez advises looking at what you have available to you, and writing around it. This is especially applicable when brainstorming short story ideas. This isn’t so different from Adam’s advice, really. And you can see it in the careers of other creative people. The link may not seem obvious, although on the surface, they’re both white guys. No one can deny that Tarantino has a distinctive visual style, but his greatest strength has always been in his writing. His first film, Reservoir Dogs (1992), had a budget just over a million dollars, but it was unlike anything anyone had ever seen before. In fact, it was the power of the script that got it placed in the hands of Harvey Keitel, and without Keitel signed on as an actor and an executive producer, there would be no Resevoir Dogs. To this day, no one writes like Tarantino -- compared to his later films, Reservoir Dogs is nothing to look at, but the strength of his voice, that thing he could do better than anyone, propelled him to greater things. He was able to do this because he knew writing with the same level of mastery as Adam Lisagor knew VFX. Once you’ve identified that thing that makes you unique, that you’re best at, you need to develop that into your visual style. And as they say, there’s only one way to get to Carnegie Hall -- an Uber. Mastery, according to Malcolm Gladwell, is a matter of practice. And practice is ultimately a matter of repetition and attention to detail, no matter how small. 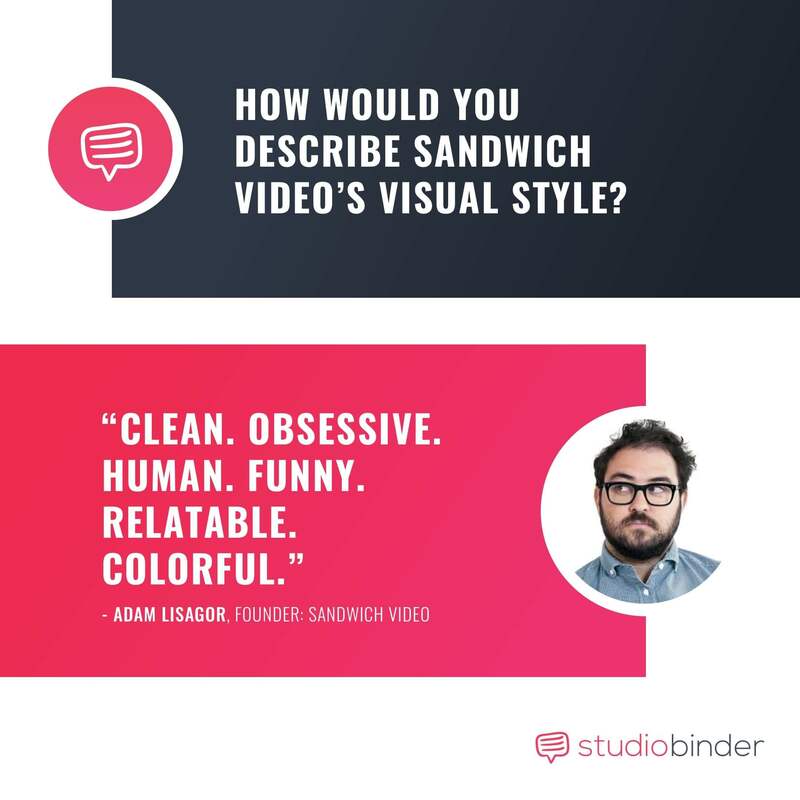 One of the words Adam uses to describe Sandwich Video’s artistic style is “Obsessive,” which can seem a little weird from someone who strives for humanity and authenticity in his video marketing agency. The surprise twist? That’s not a product video -- this whole thing is actually a trailer for a movie being produced by Amazon Studios. But Sandwich Video did such a great job with the visual effects -- even remembering small human touches and interactions, that you believe Adam really is introducing you to something amazing. If you’re starting a digital marketing agency or photography business, you probably shouldn’t try to mimic Adam’s specific style, as colorful and clean as it is. To begin with, you’ve already got a pretty powerful competitor in that sphere. But more importantly, it’s not you. It’s not authentic -- and as we’ve discussed, audiences can sense falsehood from feature films to video marketing campaigns. By finding out what you do better than anyone else, you become the absolute best at it and drive yourself to get better. Quality will always will out. Even if it’s not immediate, people have a way of finding what is truly unique and truly good. Adam’s advice for developing your creative voice goes a bit against a lot the standard advice. His visual voice was, to a degree, designed. But while it was designed, it was not constructed. His video marketing agency was built on a foundation of computer graphics because he knows computer graphics. His everyman, deadpan style has become Sandwich Video’s artistic style because that’s who he genuinely is. And at the end of the day, couldn’t you just define your visual voice as the thing that you are genuinely best at? What do you like about Sandwich Video’s content? What do you think you’re better at than anyone else? Let us know in the comments below.